Fortunately e19 landed just in time to get into openSUSE 13.2, for those who have used e18 you will notice lots of similarities for those who haven’t have a look here. I also haven’t covered alot of the things that were new in the last release that can be found here. The most noticeable difference is the new theme and if you don’t like it there’s two others to choose from including a light theme, the openSUSE 13.1 theme is also avalible in the enlightenment-theme-oliveleaf package. Thanks to vast improvements to ibar we have also been able to include a dock based profile as shown below. Other new modules include a new tiling module, new pager with live previews, a packagekit module and a music control module, along with some others. Some changes to be aware of are, the e19 package is now called enlightenment, e17 is still availble in the e17 package and for those who use e16 it is now in the package called e16 rather then the one called enlightenment. Unfortunatly not all the patterns got updated correctly so the enlightenment pattern will still install e17. e19.1 and a new efl version will be pushed to openSUSE 13.2 as maintenance updates over the next couple of weeks. So, what is the correct way to install it? Is this stable or should I still use e17? Installing the enlightenment package in openSUSE 13.2 is the best way to get a stable version, from pretty much everyone i’ve spoken to e19 is more stable then e17. Thank you for your work in getting the latest enlightenment into openSUSE. The look of enlightenment looks great. 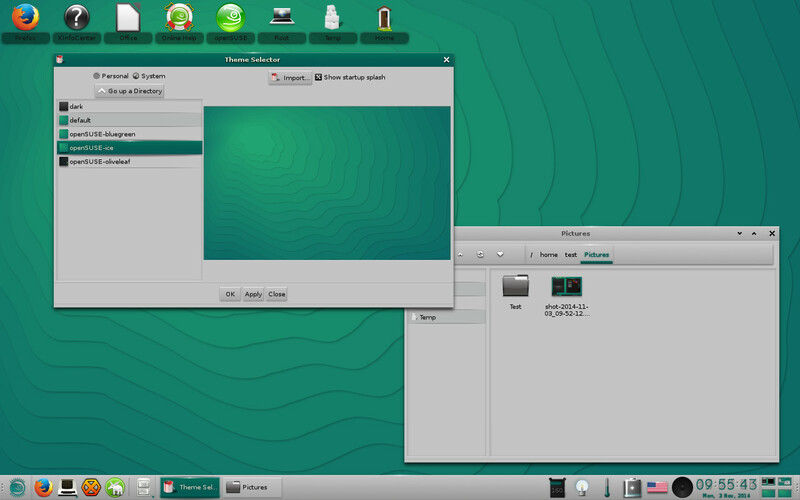 It is especially nice how the openSUSE distribution wide theme is integrated in this version. Is there any effort to make these features available for enlightenment (e19)? I would also appreciate any comments that you think would be helpful for the problem I described. By the way, are you the maintaner of enlightenment on openSUSE? Hi, thanks for your comments I am one of the main maintainers for enlightenment on openSUSE. One of the reasons we have kept e17 in the repo is due to the fact that modules like the scale ones don’t exist in later versions of enlightenment. Unfortunately due to the fact that these modules mostly used hacks in the older implementation to work they require a full rewrite to work again now, as far as i know no one has started this process. The way i manage the 20+ windows that often end up between the 2 screens of my work PC is to group windows on different Virtual desktop, I use a 4×4 grid of virtual desktops and change between them with the arrow keys, making them all easily accessible, I put my most frequently used applications in the middle workspaces and others on the outer, I also tend to open the same programs on the same desktop each time so i remember where everything is, doing this i end up with generally no more then 4 windows per virtual desktop and the ability to switch to anything without many key presses. Another alternative in e19 is the ibar on your shelf can group and show windows buy application which if you mostly just have 5 firefox windows and one or two others is generally enough. Hello, where i can download? Thank you for the work you do in getting enlightenment into openSUSE. I discovered Enlightenment through Bodhi which has been a great help in introducing me to Linux in a simple way. But I do prefer openSuse to Ubuntu – and so my journey with Linux and enlightenment has moved to openSuse. The thread seriously questions the viability of enlightenment e19/e20 for Bodhi – and considers forking e17? I wondered whether you have seen the thread. Have you commented? What are your views – especially with regard to the future of enlightenment and opensuse? Sorry, just a clarification. You could go through the thread I have pointed to above to see why Jeff at Bodhi Linux is planning to fork enlightenment – but post #40 in the thread is where the plan to do so is outlined.